The Easter Bunny hops on the Alamo Plaza Trail on Saturday, April 13, 2019. 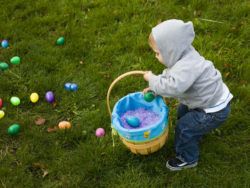 Come enjoy this free community event that includes visits with the Easter Bunny, an egg hunt at participating merchants, face painting, balloon twisting, a kids crafting activity, and so much more. Enter to win a $25 Safeway gift card when you register for free and check-in via Eventbrite. One lucky winner will be randomly selected. Print your tickets or install the Eventbrite App to check-in on your mobile device. Please bring your own cameras.